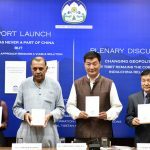 New Delhi: The Department of Information and International Relations (DIIR) of Central Tibetan Administration (CTA) today launched a flagship tri-lingual report titled ‘Tibet Was Never A Part Of China But The Middle Way Approach Remains a Viable Solution.’ The report published in Tibetan, English and Chinese languages, was unveiled by Prof. Anand Kumar, Socialist and Reformer, and Dr. Lobsang Sangay, President of CTA, at an event held at India International Centre. Prof. Anand said that under the Chinese occupation, it is not only Buddhism but the entire belief system that is suffering. 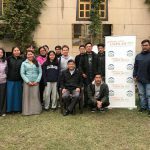 Lamenting that imperialism has no future, Prof. Anand said that for India and for the rest of the world, Tibet is the beginning of the solution to achieving peace in the world. “Freedom in Tibet ensures India’s security, and therefore ignoring Tibet’s tragedy is akin to living in denial,” asserted Prof. Anand Kumar. Prof. Anand Kumar extolled the principles of the Middle Way Approach envisioned by His Holiness the Dalai Lama, and said that His Holiness and his understanding of the Asian roadmap is our (India’s) roadmap. “Our understanding is that in Tibet lies the key to stability in Asia,” concluded Prof. Anand Kumar. 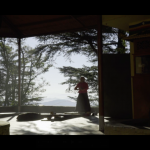 Pointing to the ludicrous efforts of Chinese leadership to recognize reincarnate Lamas, Bishops and Imams, Dr Sangay admitted with conviction that in the case of Tibetan Buddhism, the sole authority to recognize reincarnate Lamas lies with Tibetan Lamas. Explaining that the Middle Way Approach is the most viable option to resolving the longstanding Sino-Tibet issue, Dr Sangay called for the resumption of dialogue between the envoys of His Holiness the Dalai Lama and the Chinese representatives. 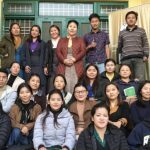 DIIR’s International Relations Secretary and CTA’s Spokesperson Sonam Norbu Dagpo thanked the 18 plus writers and editors at CTA, in particular at DIIR for contributing to the publication of the report in three languages. “Regardless of how much the PRC attempts to cloud the world’s view of Tibet, as long as Tibetans and their supporters continue to publish and promote information that reveals the truth of what goes on in the region, the push for the rights of Tibetans will continue. This report marks the CTA’s current contribution to this effort,” concluded Secretary Dagpo. 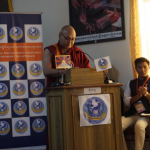 DIIR’s Information Secretary Dhardon Sharling opened the event with the words; “Just as we speak here today, in Putian, southeast China’s Fujian Province, the 5th World Buddhist Forum is underway. 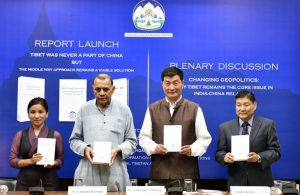 Buddhism and Belt and Road and Buddhism and Maritime Silk Road tops the agenda for the three-day forum.” Explaining that the report seeks to provide a tool to strengthen the challenge against disinformation on Tibet, Secretary Dhardon said the report provides the most comprehensive overview on Tibet’s past, present and future.